We asked the 97 contributors to the Nancy Drew Anthology (Silver Birch Press, October 2016) to send photos featuring the book in their home environments for a series we’re calling “Nancy Drew Around the World.” Author Shahé Mankerian provided this photo taken at The Getty Center in Los Angeles. Shahé contributed the poem “Dear 12-Year-Old Self,” featured below, to the 212-page anthology. Ride your bicycle a lot. to girls, go to the library. might be shy, but talk to her. she checked out to her bike. and apply for a library card. NOTE FROM THE AUTHOR: While visiting the Getty Center in Los Angeles, I couldn’t help notice the painting by the French painter Jacques-Louis David. In the portrait, the Sisters Zénaïde and Charlotte Bonaparte (Napoléon Bonaparte’s nieces) stare at the viewer blankly as if they are caught reading a secret letter. A clue. Naturally, the painting reminded me of Nancy Drew. More so, it reminded me of the Anthology cover: Nancy Drew’s shadow keeps her company as she sits hunched over a clue. The shadow acts as an extension, Nancy’s body double. Finally, look at Nancy’s stylish gray dress suit, and the depiction of the overextended shadow in obvious black. Now, look at the painting. Notice the colors of the clothing on the Bonaparte sisters? Gray and black. Coincidence? ABOUT THE AUTHOR: Shahé Mankerian is the principal of St. Gregory Alfred and Marguerite Hovsepian School in Pasadena, California, and the co-director of the Los Angeles Writing Project. As an educator, he has been honored with the Los Angeles Music Center’s BRAVO Award, which recognizes teachers for innovation and excellence in arts education. His most recent manuscript, History of Forgetfulness, has been a finalist at four prestigious competitions: the 2013 Crab Orchard Series in Poetry Open Competition, the 2013 Bibby First Book Competition, the Quercus Review Press, Fall Poetry Book Award, 2013, and the 2014 White Pine Press Poetry Prize. His poems have been published in numerous literary magazines. On October 8, 2011, a displaced East Coaster walked into the Goodwill in Gallup, New Mexico. Amid the strewn trash, he spotted an abstract painting, reminiscent of one in his high school English textbook next to Allen Ginsberg’s “A Supermarket in California.” He saw one which looked like a Julie Mehretu he had seen at the Carnegie International in 2004. Adrenaline rushing, he looked for more. A Jackson Pollack, Silver Over Black White Yellow and Red, One Number, 31, Lucifer, Alchemy, or Sea Change. 3 others. A misplaced Chicagoan, blonde, 40s, vaping, a high school teacher on the rez, used these paintings as an excuse to hit on him. He offered her one. He rushed the paintings to his wife, rummaging through the women’s clothing. He wanted to buy the lot, but the price tags of $8 – $15 intimidated him. The blonde put one back. He bought all but one of the big paintings and went back that evening for the small ones. He hung them and thought the pain which seeped through the canvas might be mold. The abstract expressionist extravaganza which is the group of paintings by Richard B. Stifler I bought that day is my prized possession. Stifler was a dabbler in the arts, a Beatnik who read On the Road one too many times, and upon his graduation from psychiatry school took up residence in Gallup, New Mexico. Even though he died two years before I came West, he haunts me. His name pops up, written inside the covers of avant-garde books I buy at Goodwill. One particular vintage Marquis De Sade paperback tome comes to mind. When I die, donate my Stiflers to the Albuquerque Museum or for display on the walls of UNM Hospital. I lament the lost Stifler—the one I didn’t take that day. PHOTO: A Stifler painting from the author’s collection. NOTE FROM THE AUTHOR: I’m not sure of the value of my Stiflers, but I spend a lot of time in art galleries — especially contemporary art galleries — around the world. The only thing that separates them from many prized exhibition pieces are the size, say 28″x28″ or 8″ x 14.” I’m a big fan of abstract art because the interpretation is in the eye of the beholder. I have talked to physician’s assistants who have worked with Stifler, and I found an old news clipping about the birth of his first child. One physician’s assistant told me he was inspIred by Navajo blankets. To me, Stifler is the Blake in his garden of the fringeland surrounding Navajo Reservation. 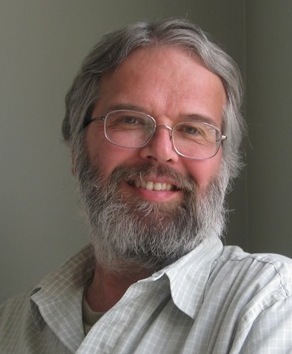 ABOUT THE AUTHOR: Tom McLaren is originally from Pittsburgh, but has traveled extensively and lived for a few years in East Asia, where he was a professor of literature and oratory. 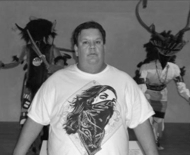 He has written a few unpublished dramatic works, and his work has appeared in such publications as Word River Literary Review, Gallup Journey, Flipside, and Martial Arts Training. In addition to writing and presenting at academic conferences, his hobbies are judo, aikido, and jujutsu, EDM and Goa Psytrance, and trips to Las Vegas. PHOTO: The author at a museum in 2010. 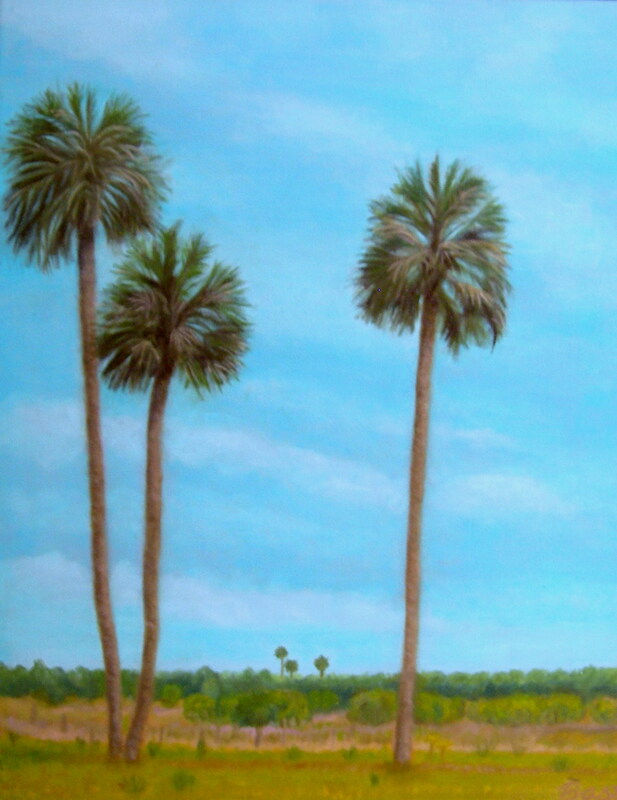 NOTE FROM THE AUTHOR: My MFA is in Painting, so ekphrastic poetry is a natural for me. I wrote this after visiting a small Alice Neel retrospective a few years ago. It appears in my book, Fugitive Pigments, which is centered on art. PAINTING: “Self-Portrait” by Alice Neel (1980). PHOTOGRAPH: The author at home in a striped chair. ABOUT THE AUTHOR: Ruth Bavetta’s poems have been published in Rhino, Rattle, Nimrod, Tar River Poetry, North American Review, Spillway, Hanging Loose, Poetry East, and Poetry New Zealand, among many others, and are included in four anthologies. She has published two books, Embers on the Stairs (FutureCycle Press) and Fugitive Pigment (Moon Tide Press). Two more books, No Longer at this Address (Tebot Bach) and Flour, Water, Salt (FutureCycle Press) are forthcoming. She loves the light on November afternoons, the smell of the ocean, a warm back to curl against in bed. She hates pretense, fundamentalism, and sauerkraut. PAINTING: “Escaping Criticism” by Pere Borrell del Caso (1874). PHOTOGRAPH: The author at nine years old in San Francisco (circa 1960). Paul Fericano’s poetry and prose have appeared since 1970 in such diverse outlets as The Wormwood Review, Second Coming, Jean’s Journal, Saturday Night Live, Vagabond, The Mas Tequila Review, Mother Jones, Poetry Now, Wine Rings, The Café Review, Paul Krassner’s The Realist, and Krokodil (Moscow), Punch (London) and Charlie Hebdo (Paris). In 1983 his work was honored with both the Ambrose Bierce Prize (San Francisco) and the Prix de Voltaire (Paris) for upholding the traditions of socio-political satire. His latest collection of poems, The Hollywood Catechism (Silver Birch Press, 2015), was nominated for a National Book Award. I wait silently on the promise of my son’s return. of words drowned rather than drew him out. that children hear and parents don’t. down the tongue and off the lips. It has been years since my voice was broken. I wait for him to know if it has recovered. I wait. NOTE FROM THE AUTHOR: While Lawrence Ferlinghetti [in his poem “I am waiting”] finds ways to throw in waiting for the proverbial kitchen sink, my mind is much less diminished. I can only work on a slender thing. “To A Roman” has its genesis in silencing a child by saying too much and watching him withdraw. Parents have sound bites they repeat like tics as a child grows older, seeming harmless tics, yet they help drive the child away. 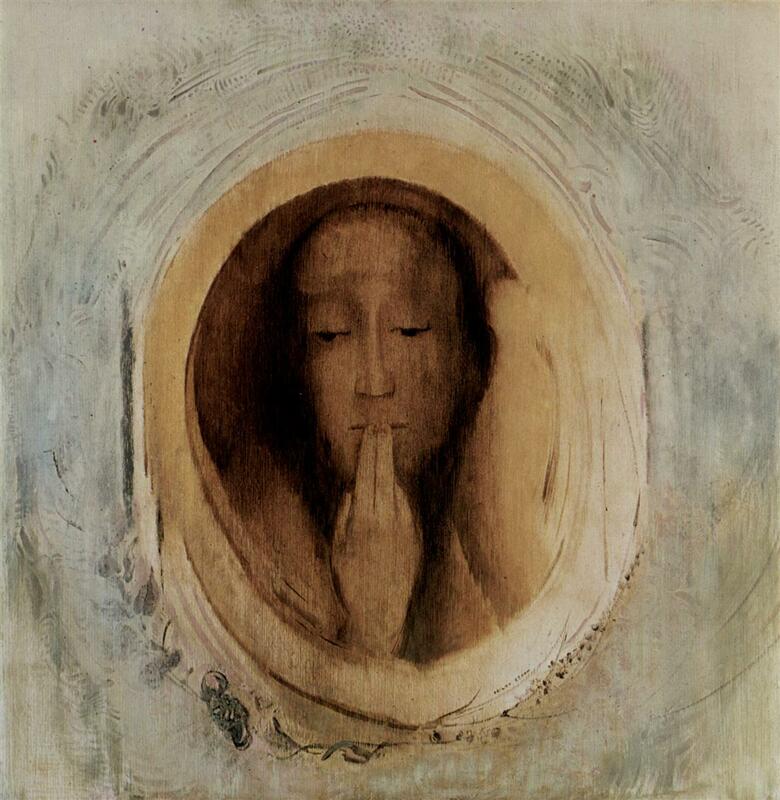 IMAGE: “Silence” by Odilon Redon (1900). ABOUT THE AUTHOR: Jeff Burt has work published or forthcoming in Eclectica, Typehouse, Storm Cellar, Windfall, and The Cortland Review. He won the 2011 SuRaa short fiction award. its last great breath still holds. NOTE FROM THE AUTHOR: On the first day of winter, I happened upon an image of a huge, stranded, and listing fin whale. The association of darkness with death, which the image seemed to evoke, was apt; yet, in this season of hope-filled waiting, I allowed myself to consider the possibility that the animal remained alive. 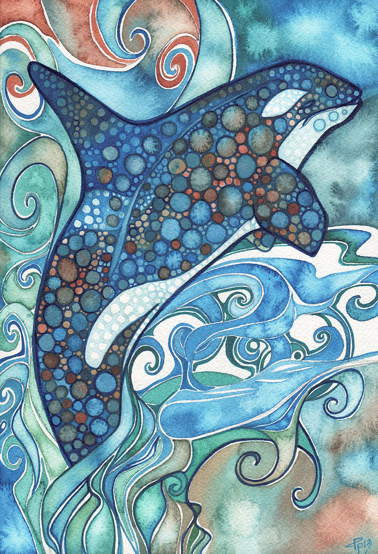 IMAGE: “Orca” by Tamara Phillips. Prints available at fineartamerica.com. 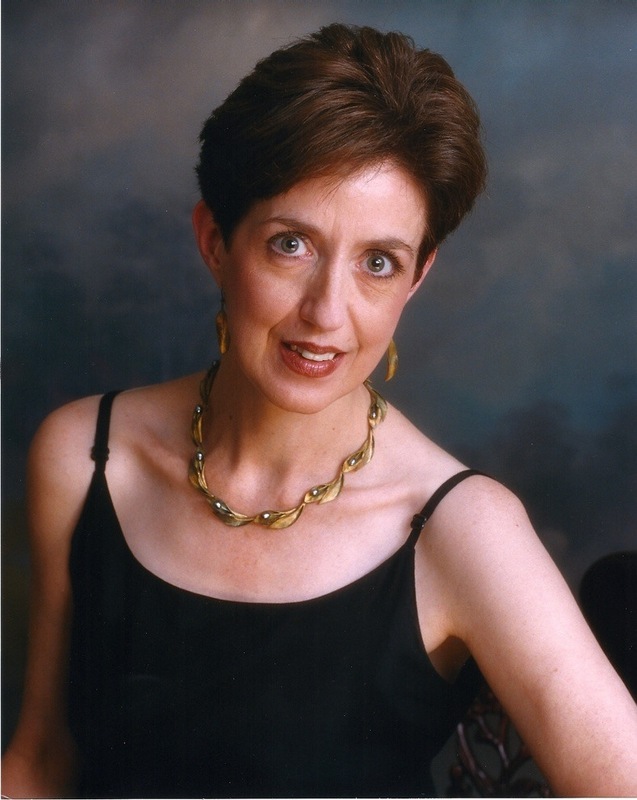 ABOUT THE AUTHOR: Maureen E. Doallas is the author of Neruda’s Memoirs: Poems (T.S. Poetry Press, 2011). Her work has appeared in Open to Interpretation: Water’s Edge, Open to Interpretation: Love & Lust, Oil and Water… And Other Things That Don’t Mix; Tania Runyan’s How to Read a Poem; and Felder Rushing’s book bottle trees. Her poems can be found at Broadsided Press (“Responses: Ebola 2014”), Split This Rock (“Poems that Resist Police Brutality & Demand Racial Justice”), Every Day Poems, The Woven Tale Press, The Found Poetry Review, The Victorian Violet Press & Journal, The Poetry Storehouse, Escape Into Life, and other online and print publications. She blogs at Writing Without Paper, is an Artist Watch editor for Escape Into Life, and has a small art business, Transformational Threads. Her interviews and features appear regularly at TweetSpeak Poetry.